Next up was a hands-on Apprentice program in biochemistry. 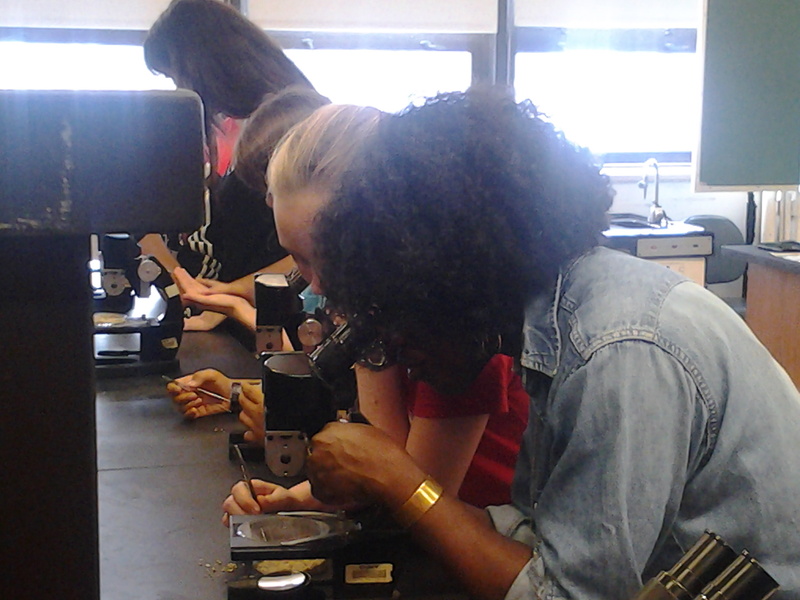 Our instructor was Mandë Holford, an Associate Professor at Hunter College who studies “killer” snails. She led a group of middle schoolers through lab work using microscopes, dissecting squid, and examining the proteins that make up toxins in animals that have beneficial applications in medicine. My official role was to stand in the lobby and direct families to the laboratory, but once it got started all of the volunteers ended up helping in the lab. Confession: I haven’t worked in a lab in a very long time! But I think I carried it off rather well and certainly enjoyed it. 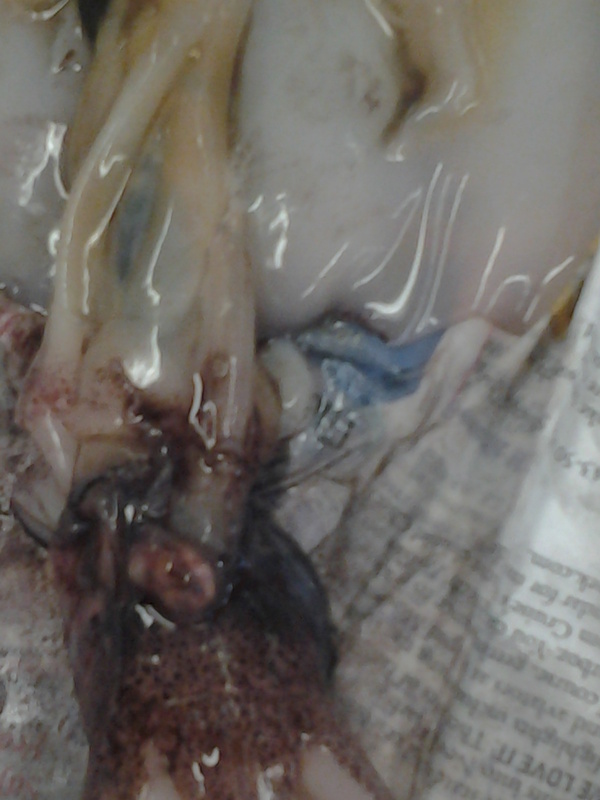 Squid Guts. Apprentice Biochemistry Lab. 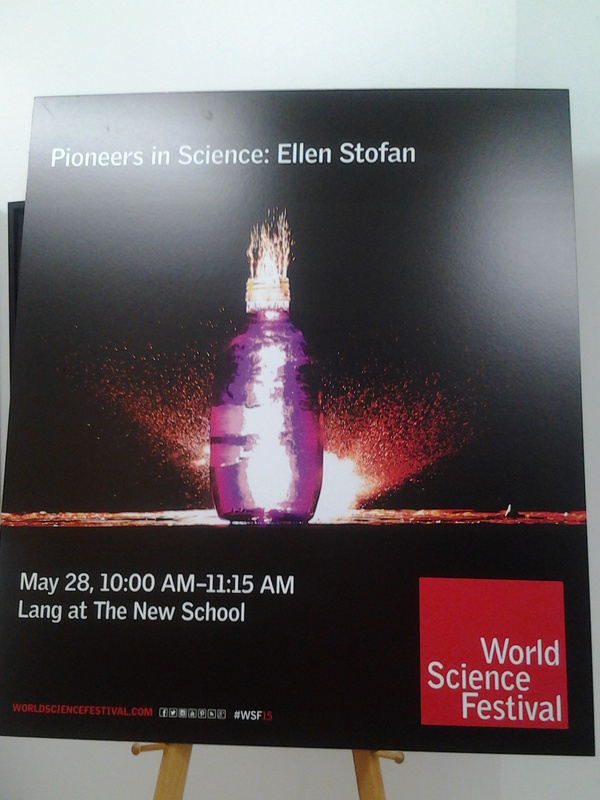 World Science Festival 2015. The last day of the Festival I drew a great assignment: a late-afternoon lecture at NYU’s Skirball Center, on the edge of Washington Square Park. So I arrived early to check out the Science Street Fair happening around Washington Square before going to my volunteer post. Maybe it’s Mom’s influence: I went straight to the NASA exhibits, including a model of the Mars Rover. 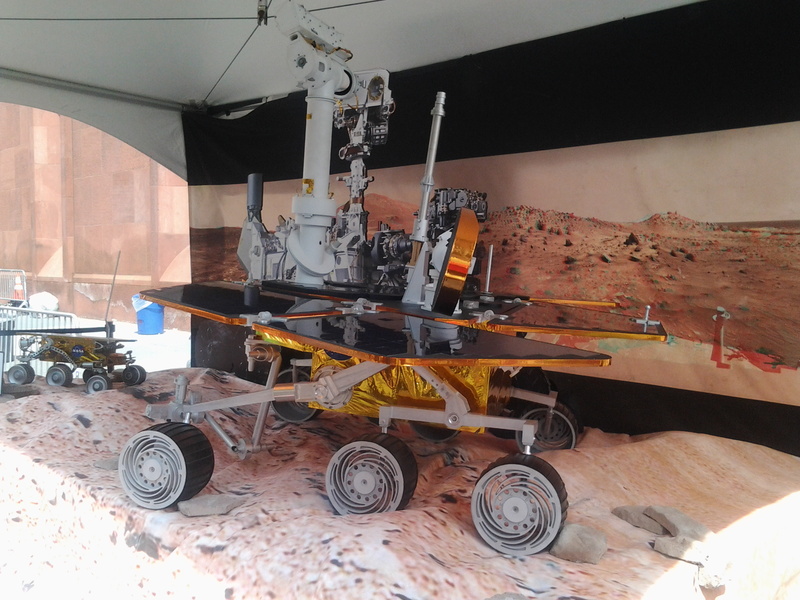 Model of Mars Rover at World Science Festival 2015. Then it was time for Quantum Mechanics! This was the largest audience I’d seen, but I’ve done work like this in my non-profit career so it was easy. We directed the crowd into the auditorium and then were able to snag some empty seats for the discussion. I took a few physics courses in college, but never got to quantum theory, so this was mostly unfamiliar territory. I’ve read about the wave/particle duality and the metaphor of Schrodinger’s cat, but entanglement was new to me. (Even Albert Einstein called it “spooky.”) And I’ve never quite resolved the intellectual conundrum that if observing a phenomenon alters it, how can we be sure we know what’s happening? You can watch “Here, There & Everywhere: The Next Quantum Leap” here: The Next Quantum Leap. And maybe that’s what it really means to “get my geek on” now. It’s been years (decades, really) since I took a formal science course. I do read about science and technology, and I’ve attended some lectures and panel discussions now and then. But much has changed since I studied chemistry and Newtonian physics in college! So I experienced the World Science Festival as a knowledgeable layperson, sometimes surprised at what I remembered and sometimes baffled by new information. My head didn’t explode; but it’s possible my brain stretched a little. If you did attend, let us know in the comments what you saw, what you enjoyed, and what you learned. Next Article They Swarmed Us: What Would Happen if the Wealthy Rebelled?